Show Me the Money: Hey Marketers, Boomer Women Are Buying Stuff! Do you buy stuff? Yeah, so do we. Somehow, we manage to look online or go to a store and buy things—even though very few marketers spend very little money trying to persuade us to do so. Apparently, we don’t exist! Yet, women born between 1946 and 1964 comprise the healthiest, wealthiest and most influential generation of women in U.S. history, as noted in a 2013 Girlpower Marketing report. Consider the facts: An estimated 38.44 million women are in the Boomer demographic right now, and women in general drive 70% to 80% of all consumer purchasing. In the next decade, women will control two-thirds of the of the consumer wealth in the United States. Many Boomer women are continuing to earn income by working, and some also will manage inheritance windfalls from their parents or partners. Women make 80% of home improvement decisions, buy 65% of all new vehicles, and spend more than $55 billion dollars on consumer electronics annually. Yet, in aggregate, advertisers spend about 8% of their budgets targeting people of age 50 and older, says the AARP’s Dave Austin, managing director of marketing agency Influent50, which helps brands promote their products to the over-50 crowd. Nielsen estimates that only 5% of advertising dollars are spent marketing to over-50 crowd. Eight percent, five percent—either way, the amount spent specifically on Boomer women is miniscule. One obstacle is that not enough women hold senior positions in the advertising and marketing industry. Only 11% of U.S. creative directors are women, let alone Boomer women. Another factor is the historical advertiser focus on snagging consumers early in their lives to win lifetime brand loyalty, even though research shows that midlife women are just as likely to switch brands as the younger set. Also unfortunate, brands that potentially could be relevant to midlife women don’t necessarily target our demographic. Or, their images and messages don’t work for us—presenting women only as part of couples, as cardigan-wearing grandmotherly types, as technologically inept or in other less-than-representative modes. Actor Diane Keaton in Chico’s 2011 “Holiday” campaign. 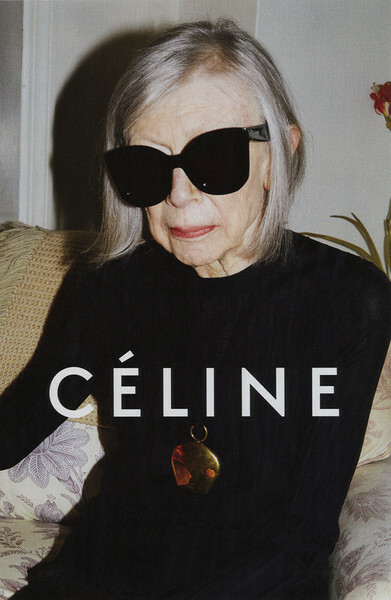 Author Joan Didion for Celine. Brands that ignore get ignored in turn. Have you ever stopped buying a product because the company that made it seemed to think you didn’t exist? Girlpower Marketing’s 2013 survey found that 64.2 percent of Boomer women abandoned a product because they felt the brand was ignoring them. The 2013 Girlpower survey found that the brands that did a good job of speaking to midlife women included Eileen Fisher, Dove, L’Oreal, Cadillac, Olay, Amazon, Target and Avon. Pharmaceutical companies, financial services and the fashion industry, in particular, have shown some savvy in targeting midlife women. Eileen Fisher, of course, has included a diverse range of women in its advertising for years, including Cindy Joseph (who launched her modeling career at age 49). Gap’s “Dress Normal” campaign included Anjelica Huston, along with other celebs of various ages, and L’Oreal’s Paris ads have included Helen Mirren and other women of different ages. 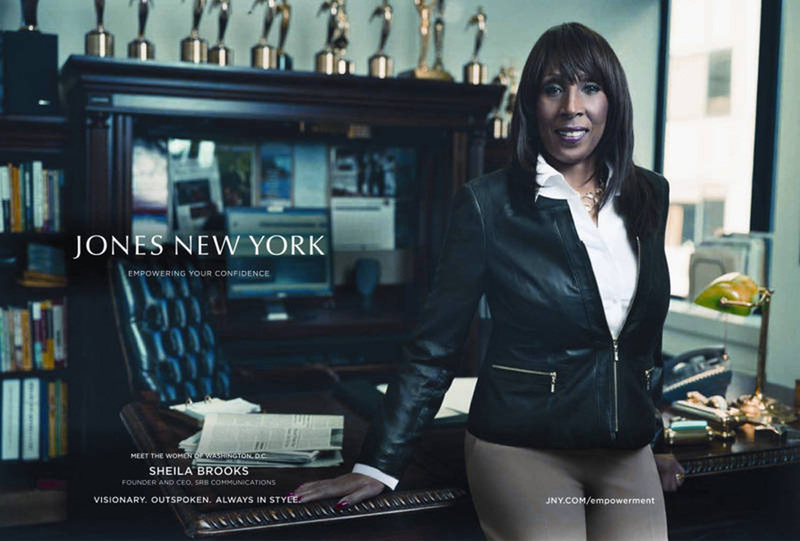 Jones New York’s “Confidence” campaign featured women with over-the-top resumes, including Dee Dee Myers, political analyst and commentator, and Sheila Brooks, founder and CEO, SHB Communications. Celine went with Joan Didion—a style icon in her own right—for one of its campaigns. The reality is that midlife women are generally vibrant and young at heart, and more financially independent than our predecessors. We need, want and buy different things today than when we were in our twenties, and some of us like to try new things. And, if we’re lucky, we can afford to buy more of the things and experiences we want. So what up, advertisers? Maybe our wallets deserve your attention, too.